Quilts can be ordered for a higher price. Quilts made prior to 2014 can be purchased for less. "Reeds Mill Church Ladies Sewing Circle"
Meeting almost continuously since its inception, the Circle is well known in the area for its beautiful quilts. In sizes from King size to Baby crib, each is hand crafted and made with love. 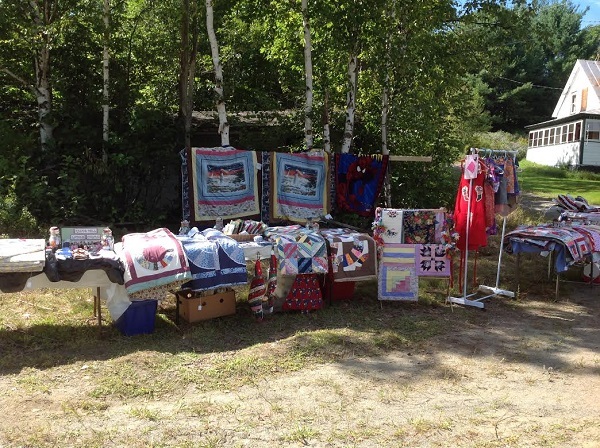 Proceeds from these quilts go to the support of Reeds Mill Church and other local benevolences. New members are always welcome. Learn how to quilt or just help out with the cutting or pinning. Or ask how you can obtain one of these very reasonably priced, one-of-a-kind quilts. Circle meetings are held on the first and third Thursdays of every month from 10:00am to Noon followed by a potluck lunch. The meetings are generally held at Marie Bubier's home. Contact Marie Bubier at (207) 639-4666 or email Reeds Mill Church at vrobie@live.com for more information.